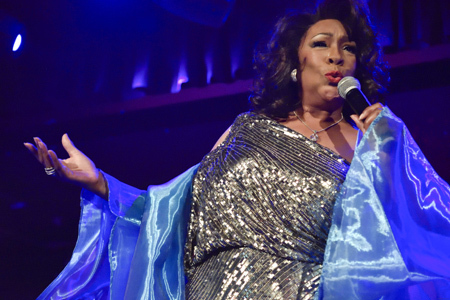 Mary Wilson has been a part of the music and cultural fabric for about fifty five years through being an original member of The Supremes. Coming from humble beginnings in the Brewster-Douglass Housing Projects in Detroit, The Supremes were one of Motown’s earliest signings in ‘61 since Berry Gordy formed it in ‘59. It’s been forty years since Mary left The Supremes, at which point they disbanded. Diana Ross left in ‘70 and Florence Ballard was forced out by Gordy in ‘67. Various members came and went in the intervening years. It’s the original trio of Mary, Flo and Diane Ross (changed to Diana) that’s most fondly remembered by most true fans. It’s also the trio that had the biggest string of hits. Mary has a leg up in being able to sing songs that are hugely recognizable via The Supremes’ long line of hits in the ‘60’s. Most were written and composed by the then in-house writing team of brothers Brian and Eddie Holland and Lamont Dozier. Most of them here were: You Can’t Hurry Love, My World Is Empty Without You (a personal fave of mine) Reflections, Love Child, Come See About Me, Back In My Arms Again, You Keep Me Hangin’ On, Where Did Our Love Go, Baby Love, Stop! In The Name Of Love, Baby Love and Someday We’ll Be Together. A male and female back up singer accompanied Mary, and they very ably added the needed backup harmonies. Mary also had an excellent band. It was clear that the keyboardist was in charge of them. The house was full and very into it. Baby boomers comprised much of the audience, which were treated to a meet and greet after the show that Mary kindly offered. She signed items and posed for pictures with her own CD for sale at the table. What does Mary the performer bring to the big table? A rich, long and enduring history that never sounds old. That’s because these are classic and stellar songs that will be around forever.